I picked this up at the secondhand book sale downstairs from my work while popping out for lunch the other day. I have been in such a reading slump lately, and unable to drag myself out of it with what I had, so I decided to grab something at random, something I knew would be a quick read. Dean Koontz fits that bill: entertaining, quick, and easy. The House of Thunder was no exception. The book seems to meander on, telling us about Susan, her accident, and being in a hospital after awakening from a coma. We deal with her thoughts, her fears, her recover, and the way she falls in love with her doctor. We also follow her through her abject terror when some horrendous men from her past seem to be popping up in her present, men that killed her college boyfriend, men who are dead. This is essentially the guts of the book, the back and forth about Susan’s sanity, the thinking about how things are possible, what the hell could actually be happening. The era that the book was set in, too, is something I liked. SPOILER: The Cold War spin on things is actually something I quite liked, though I can see that it is going to be annoying for some. I was always fascinated by the Cold War, and how insane things were back then. The premise for this is preposterous, but if you let your conspiracy mind take over, you might just have some fun. 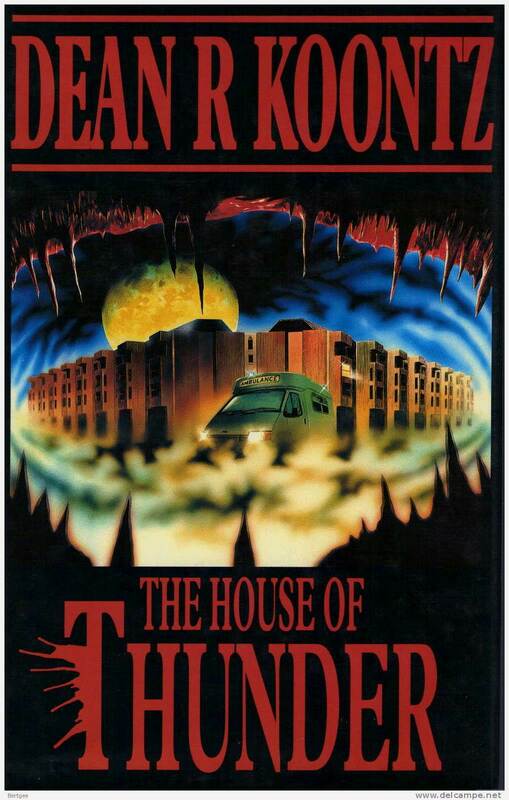 The House of Thunder definitely has its flaws, the main perpetrator being that it was too long, and wasted a lot of time just going over the motions, never really going anywhere, but even with that managed to barrel along. Not a bad read, though not the greatest, either. It lacks depth, even while it entertains. Definitely helped me with my reading slump, though I am still not totally recovered. Let’s see how it goes. This entry was posted in Books and tagged book reviews, books, Dean Koontz, horror, Insanity, quick read, reading slump. Bookmark the permalink. Nice review Zoe! I’ve read a fair few books that seem to take FOREVER to get started. I read a thriller called The Shining Girls recently (you may have read it?) and I was over 1/2 way through before anything ‘really’ happened. Lol! But it’s true! I am clawing my way out of it though! I’m old. Plus now i gotta f**king think about a new Paul Giamatti post and all that. Yay for making monthly. . . things . . .
LOL! You can do it, you can! xD Plenty Koontz been going on for the last while hahahaha. Oh that made me laugh. This one was going so well, and I was really wondering how they were going to explain it all, and the end was a little silly. I liked aspects of it, but others I hated because… well… really, it could have been set up much better than it was. Ugh. Do it! Koontz books are definitely good, fast, easy reads!